Brunch has become somewhat of a hot commodity over these last few years and has truly transformed into THE social event of the week. And because it’s on the hot tamale train, places are inventing new items that’ll have you devouring your dish like you’re at Taco Bell at 4 a.m. on Saturday morning – but classier. 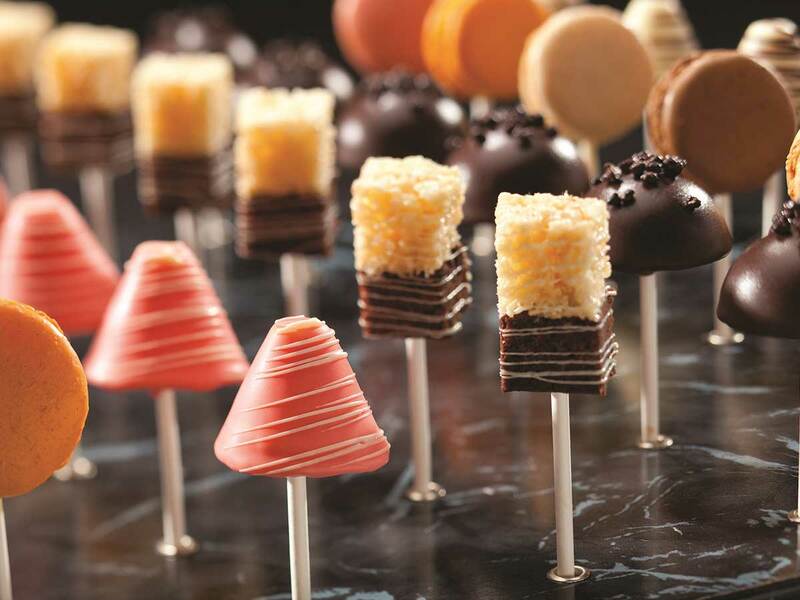 To really stand out, restaurants have to go above and beyond by creating a “wow” factor. Bottoms up, it’s time to get your brunch on at these unique places to have brunch in Las Vegas. The queens of brunch have arrived, Dahling. They don’t need crowns, they have drag. Drag Brunch at Señor Frogs inside Treasure Island is as crazy as it sounds. In true Vegas fashion, it makes sense that we have a brunch with a drag show. We are called the Entertainment Capital of the World, and boy, do these girls know how to entertain. While you stuff your face with the all-you-can-eat buffet and all-you-can-drink mimosas, the ladies go around and flaunt their stuff. And to make it even better, the staff lets you man handle (no pun intended) a few bottles each at your table. After you see these queens perform, you’ll be strutting your stuff out of brunch. Shantay, you stay. You don’t have to follow the rainbow to come across this pot of gold. 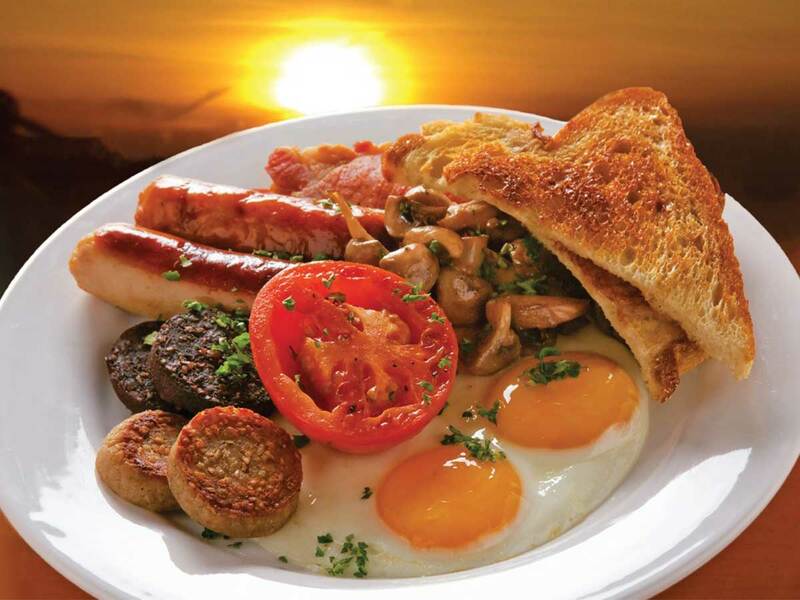 Rí Rá at Mandalay Place gives you the perfect Irish breakfast you need after a night of Jagger bombs and searching for leprechauns. This place is one of the few that offers an array of Irish food. Dive into their Irish Breakfast, Breakfast Boxty (three eggs scrambled with Irish banger & red pepper wrapped in a potato crepe, cheddar cheese and hollandaise) or the traditional Corned Beef Hash. If there are a few things the Irish know how to do, it’s drinking and curing hangovers. So, why not do both at the same time? Why limit brunch to just the weekend? At Tom’s Urban inside New York – New York, they embrace the burning desire for brunch by having a “most-of-the-day” brunch menu from 7 a.m. to 4 p.m every day. They understand that we love to sleep-in after a night at Hakkasan and that sometimes noon is just too early. So after you stumble out of bed, chug a few bottomless mimosas (because you’re in Vegas) and try out their unique menu items like the PB + B (that’s bacon, obvi) or the crispy chicken & cornbread pancake. 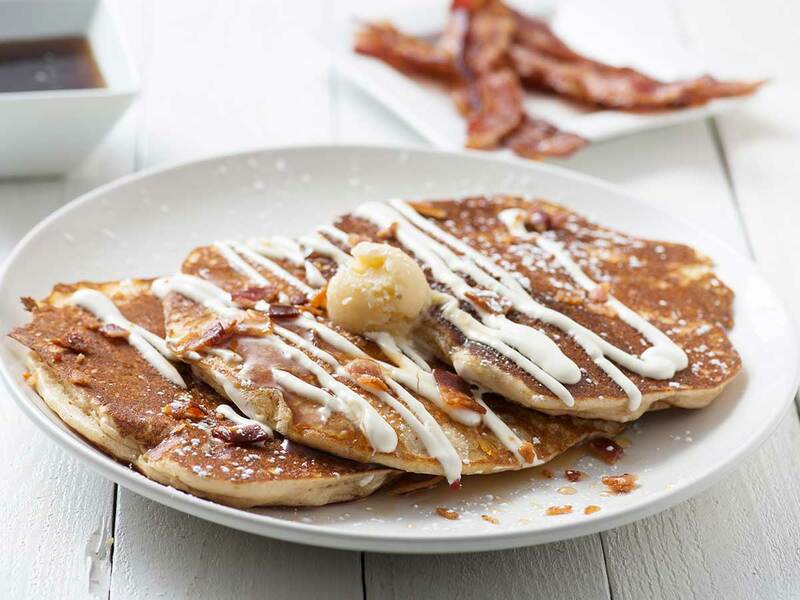 Who would’ve thought peanut butter-infused pancakes with bacon and salted caramel butter would go together? Well, it does. If you aren’t drooling by now, there’s something wrong with you and we can’t be friends. Did we mention they have a patio? We’d be doing you a great injustice if we didn’t put a buffet on here, especially since its part of our weekly ritual. Don’t judge us, it’s not a problem it’s a preference okay? Not only do you have bottomless mimosas at your fingertips, the buffet offers 500 different dishes that you can get your hands on. And it’s all yours for two payments of $19.99. If you ask us, go straight for the red velvet pancakes or their oak-grilled lamb chops, and stuff your face to the brim. We like to end our brunch excursion with their baked-to-order soufflés. Do you see why we come here every week? We need to try every combo. Food coma, activate. 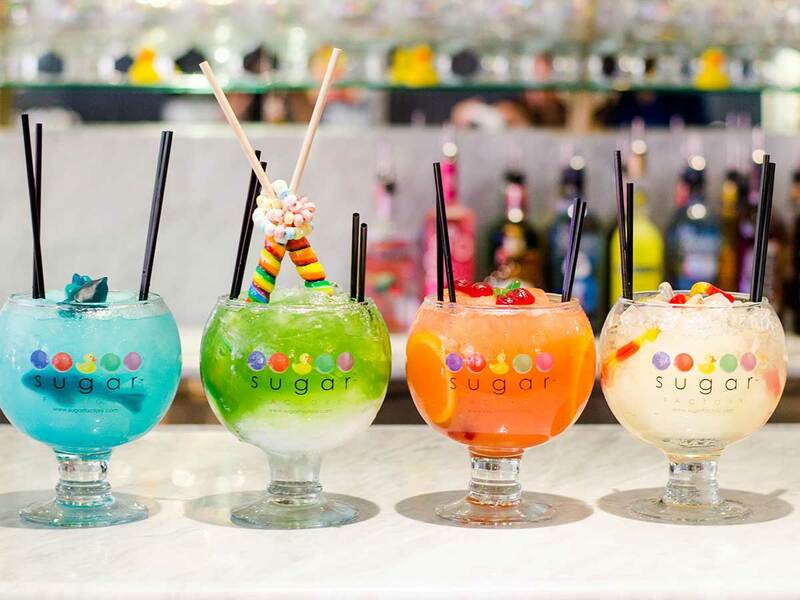 Brunch at Sugar Factory is like stumbling across Willie Wonka’s Chocolate Factory without the judgy Oompa Loompas. It’s not every day you get a golden ticket to brunch, so do it justice by eating and drinking everything in sight. Who doesn’t love a good sugar high? Yeah, they have great food (like their Nutella chocolate chip pancakes or their farmers burger), but just wait till you order a drink. They’re so big even Augustus Gloop would have a problem finishing it. You can’t go wrong with the White Gummi or the Passion Punch. With mist pouring out of the bowl, you’d think it was made in the heavens – that’s because it was. Hyperglycemia, schmyperglycemia. Check out other restaurants in Vegas the next time you’re here.